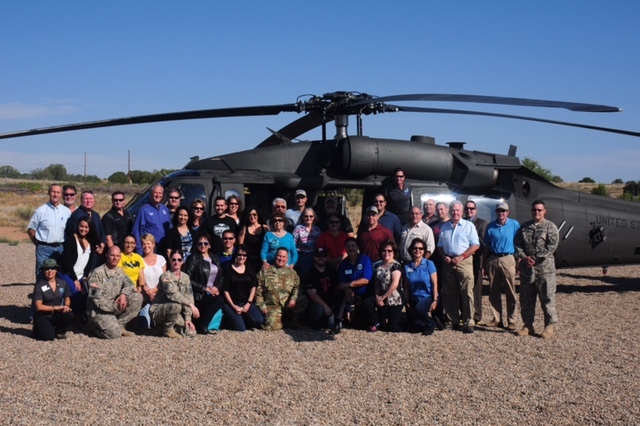 Local Premiere Bosses Sandy Dodson and her Associate Sarah were treated to a ride of a lifetime in a Blackhawk helicopter over Albuquerque in an event called "Boss Lift". The event is hosted by the Rio Rancho National Guard and Reserve and is held in appreciate of those in the community who support their efforts. The Premiere personnel were honored at a luncheon and tour, culminating in a Blackhawk ride. Joining Premiere on the event were bosses from Hewlett Packard and T-Mobile. "We employee a good number of local High School ROTC students, and we've always welcomed recruiters to park their armory vehicles in front of the theatre for movie-goers to view and enjoy," said Premiere's CEO Gary Moore. "This helps give them great exposure to a lot of young people especially in the community who may be interested in pursuing military careers." Sandy says the partnership is a no-brainer as they have a recruitment office right across Premiere's parking lot. "It was their first annual Boss Lift and we can't wait to get invited again next year!" she said.